Carlton players close in on Essendon's Mark Baguley. AFL legend Garry Lyon says the AFL Players Association has dropped the ball by failing to have a standardised system in place to address offensive sledging. It follows calls last year for the game to draw up a code of conduct charter in the wake of sledging reportedly directed at Carlton star Marc Murphy about his wife. On Wednesday, Lyon revived calls for the game to address on-field sledging following revelations Bombers star Mark Baguley sledged Blues star Jed Lamb - allegedly referencing the former Swans player's dead father. The sledge, reportedly about Lamb's murdered father, was revealed as the spark behind a push-and-shove between Essendon and Carlton players last Saturday. 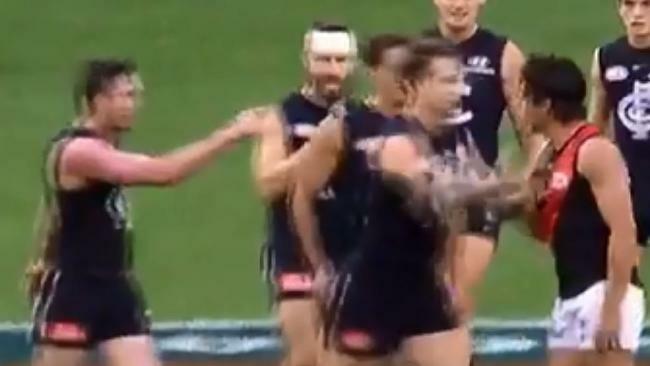 Carlton youngster Lamb was pictured pointing in angry fashion at Mark Baguley as his teammates remonstrated with the Bombers player at three-quarter time. The push-and-shove became a talking point when Blues coach Brendon Bolton entered the picture and captured telling Baguley to "f--- off". Things got heated between Carlton and Essendon players last Saturday. 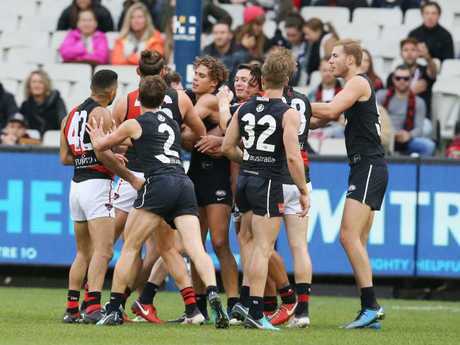 The Herald Sun revealed why Lamb was so incensed, reporting he told Carlton officials Baguley mentioned his father in a sledge despite warnings it was no-go territory. Lamb was later fined $1500 for striking Baguley, but it's the Essendon player who is now facing heavy scrutiny about whether he intentionally crossed a line. The swirling debate surrounding Baguley's comment is not going to solve anything, Lyon told SEN Breakfast. He said the issue could be fixed only when players agreed on a set of standards and the policing of those standards by themselves. "I don't want to hear from the AFL, Carlton or Essendon - this is a 100 per cent a players' association issue," he said. "It needs to be players' association driven and they need to own it. "It's no good the media talking about it, saying if it's acceptable or not. Make a code and stick to it. Then have the peer condemnation." AFLPA boss Paul Marsh said there was no sledging charter in place, but the AFL's code of conduct was able to deal with serious cases, including any instance of racism or homophobia. "This is a massive beat-up, this issue," Marsh said. "There were a few words said on the field. They were dealt with on the field. There were apologies given and everyone's moved on. Baguley has since issued a statement to clarify the incident from the weekend. "I would like to be extremely clear I was unaware Jed's father had passed away, nor was it the subject of my comment directed towards Jed," his statement read. "I was responding to Jed who had made an offensive remark about my physical appearance, something he has done in previous games. "Jed and I resolved the matter after the match and we shook hands. "I'm extremely disappointed with the reporting of this story as it is not a true reflection of the events that took place on the field." 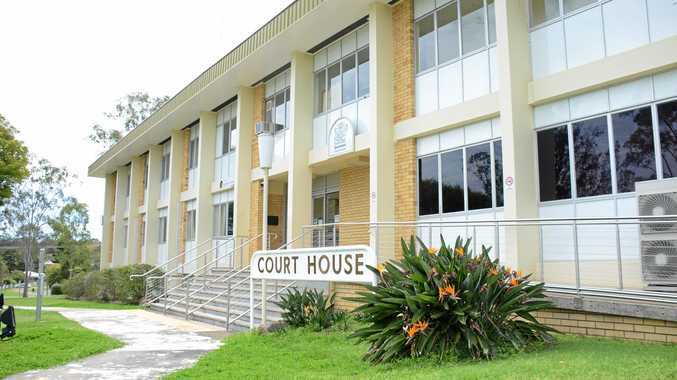 Lamb, one of eight children, was just six years old when his father was killed after a dispute in the small Victorian town of Nyora. 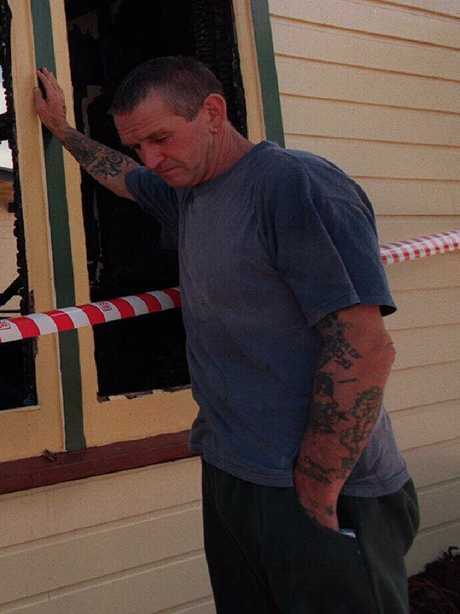 According to reports at the time, Colin Lamb was living alone in a home he was painting and renovating for its owner. His children, aged three to 16, lived in a nearby town with his ex-wife. Colin, the assistant coach of the town's under-12 football team, was drinking at home with Michael Willis, known as "Mad Mick", when the pair began arguing. Later, Willis returned with an axe. Neighbours reported hearing loud noises from the home around 8pm and Mr Lamb's body was found in the rear of the house by a friend around lunchtime the following day. Jed Lamb has spoken several times about the incident's impact on his life. "You see this sort of thing on the news and hear it on the radio but you don't think it can happen to you," Lamb told the Daily Telegraph in 2014. "Even looking back now it's hard to get my head around it. If it was going to happen I guess it's good that it happened when I was so young. I reckon if it had been when I was 13 to 16 it would have been a lot different and had a bigger impact on my life. "It had a big impact obviously with mum raising eight kids. That's why we're all so close. There's no doubt that I wouldn't be playing AFL footy today if it wasn't for mum. "It had a bigger impact on my elder brothers and sisters. When it happened they had to go into the police station and answer questions. I was too young for that. "They were at an age when they knew everything that had happened so it would have been really tough for them. It's brought us a lot closer together."